Although smallpox has been successfully eliminated through modern medicine, the original smallpox vaccine, a virus itself, has endless possibilities in research and biotechnology. 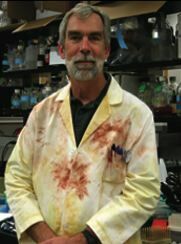 As a graduate student in the 1970s, Richard Condit was interested in the relatively new fields of molecular biology and gene expression. Now a professor of molecular genetics and microbiology, Condit decided to focus on molecular virology, and in particular, vaccinia virus, the virus used as a vaccine against smallpox. Condit says that the smallpox vaccine is not only an interesting subject, but it has a great social relevance; with the emergence of bioterrorism, there is a renewed interest in poxviruses, including both vaccinia and smallpox, spawned by the fear that smallpox will be re-released. Condit says that his research and knowledge about viruses is only half of the reward.